Australia Facts is one of the sections that provides answers to frequently asked questions about Australia. Australia, more precisely called the "Commonwealth of Australia", is the only nation in the world to cover a whole continent. 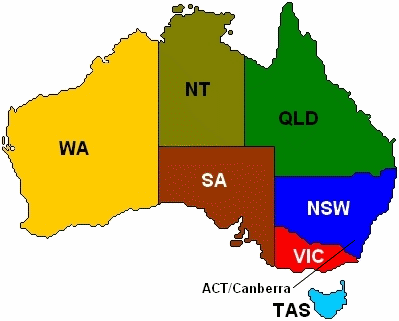 It consists of six states (New South Wales, Victoria, Tasmania, Queensland, South Australia and Western Australia) and two territories (the Northern Territory and the tiny Australian Capital Territory), all together covering 7,617,930 km2. The capital is Canberra (not Sydney, as many people still seem to think). 10,908,516 of those people are male, the female population of Australia is 10,858,195. Fact is, the vast majority of Australia's population (about 83% to be precise) lives within a stone's throw of the coast line, mostly the coast between Cairns and Adelaide and the area around Perth. The rest of the continent is pretty empty. Canberra, the capital of Australia has a population of 328,441; Hobart, the capital of Tasmania has 205,510 inhabitants, and 113,955 people live in Darwin, the capital of the Northern Territory. Australia is still a very young country, and hundreds of thousands of Australians have very recently arrived from overseas. Over a quarter (26.8%) of the Australian population has been born overseas, and roughly a third has been born overseas or one or both parents were born overseas. The biggest numbers of recent immigrants come from the UK and New Zealand, followed by people from China, India and Italy. (Yes, Italy). Next on the list are Vietnam, the Phillipines, South Africa, Malaysia, Germany and Greece. It happens every year in August: I get emails from friends in Europe and North America who tell me how hot it is there, and laugh about me shivering since it's winter in Australia. People, I live in the tropics! Important for everybody who plans to travel in Australia: There is more than one Australian climate. I also explain this on the page about the best time to visit Outback Australia. For those interested in visiting the tropical regions I have an overview of the pros and cons of different tropical seasons on the page about the northern Australian climate in the section about Kakadu National Park. You will find even more detail in the month by month account of A year in the Kimberley: climate and temperatures. Supposedly Australians write and speak British English, as opposed to American English. But if you want to communicate with us locals you better learn some Aussie lingo! Here you can read about the Australian currency and about how to access your travel funds. You will also find a handy Australian currency converter. On that page you can find clocks showing the current time for all major Australian cities, what time zone they are located in, and when daylight saving starts and ends. We do have McDonalds and Burger King! But that's probably not what you wanted to know. Read about popular Australian foods, and unusual Australian foods. Return to top of Australia Facts. Find facts about travel in Australia and facts about the Australian Outback. Return from Australia Facts to the Outback Australia Travel Guide home page.